Electric locomotive series 252, in RENFE Mercancías livery. Corresponding to era V.Equipped with five-pole motor with flywheel, functional lights according to the direction of travel. For DC systems (with interface for 14 pin decoder). 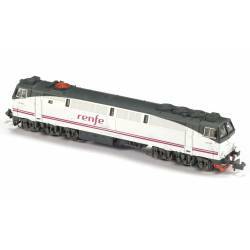 Diesel locomotive 333-022, RENFE. Green and yellow livery. Version with air conditioning and yellow reformed main light. Corresponding with era IV. Suitable for DCC systems (Digital) with sound functions. Diesel locomotive 333-022, RENFE. Green and yellow livery. Version with air conditioning and yellow reformed main light. Corresponding with era IV. Suitable for DCC systems (Digital). 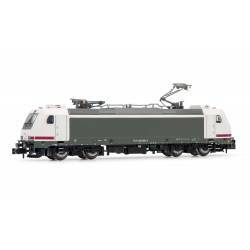 RENFE Operadora, electric locomotive, class 253, version without logos.System: DC. Digital decoder plug: NEM 651. Front/rear lights: white and red, directional. 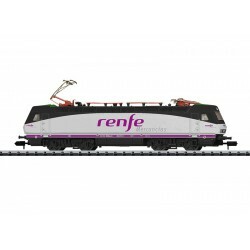 Owner: RENFE Period: VI Functional pantograph. Flywheel. Diesel locomotive 333-107, RENFE. Renfe Integria livery. Corresponding with era VI. Suitable for DCC systems (Digital) with sound functions. Diesel locomotive 333-107, RENFE. Renfe Integria livery. Corresponding with era VI. Suitable for DCC systems (Digital). Diesel locomotive 333-107, RENFE. Renfe Integria livery. Corresponding with era VI. Suitable for DC systems, with Next18 interface for decoder installation. Diesel locomotive 303.139, RENFE. Red and grey livery, corresponding with epoch V. Directional lighting. 5-pole motor with flywheel. 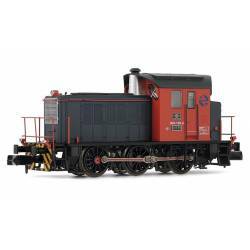 NOTE: The model incorporates an ESU decoder programmed exactly like the digital locomotives from factory, to guarantee a smooth march and the same functions. Installed in our workshop. Diesel locomotive 303.139, RENFE. Red and grey livery, corresponding with epoch V. Digital decoder plug (NEM 662). Directional lighting. 5-pole motor with flywheel. Diesel locomotive 10301, RENFE. Original version, corresponding with epoch III. Directional lighting. 5-pole motor with flywheel. 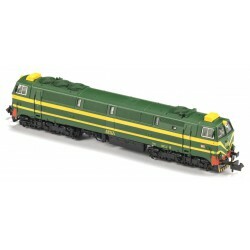 NOTE: The model incorporates an ESU decoder programmed exactly like the digital locomotives from factory, to guarantee a smooth march and the same functions. Installed in our workshop.